Reflexology is an alternative treatment involving application of pressure to the feet and hands with specific thumb, finger, and hand techniques. It is based on a system of zones and reflex areas that purportedly reflect an image of the body on the feet and hands, with the premise that such work effects a physical change to the body. Reflexology readings are an interpretation of information perceived from multiple sources and physical responses that occur during a reflexology session to explain why your body is expressing pain in certain locations. Rev. Scott Donat incorporates reflexology, essential oils and tuning forks in assisting his clients in clearing energy blockages, relieving pain and providing emotional release with the intent of helping his clients to recognize what their body is telling them and providing advice on how to improve their lifestyle for a healthier life experience. 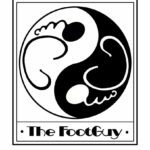 Scott “The FootGuy” is at Universal Energy Massage on Tuesdays and Wednesdays. Please call UEM at 321-480-2785 to schedule an appointment or book online. For other locations please visit Scott’s Facebook page or website.